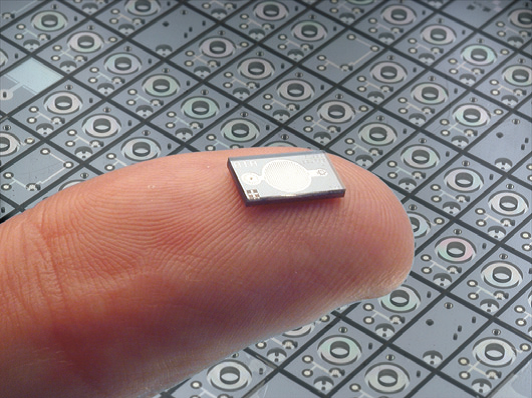 The real eye-catchers at Photonics West 2014 were miniature bio systems that can change medicine as we know it. Biosystems such as artificial organs, analytical systems and all sorts of component technologies were front and center at Photonics West 2014 in San Francisco. At this annual celebration of all things optical there were hordes (27K !) of nerds and hundreds of papers. One of the challenges is just picking which papers to listen to, and then which to talk about. One eye-catching subject was “artificial organs.” There was a little marketing spin here—the “artificial pancreas” was a miniaturized lift pump for delivering insulin. Nonetheless, this is a very elegant design fabricated in two halves on two silicon wafers and assembled into a low-power, precise, continuous pump that is being commercialized by Dibiotech in Switzerland. An “artificial arteriosclerosis” mimic has been built by a team from Twente University in the Netherlands. This consists of a correct-scale microfluidic device with arteries and a pinch point that mimics arterial plaque. They showed that the protiens associated with blood clots formed at the pinch point. The same team showed a fascinating miniaturized centrifuge that created a single liquid drops containing single cells. This will enable much better controlled experimentation when the impact on single cells can be evaluated. On the sensor side, a team from IMEC showed a miniature high-resolution microscope. They place the object directly on a large imager and use coherent illumination. The imager collects a near-field interferogram. Courtesy of the advances in compute power, a Fourier transform of the interferogram produces an image equal in resolution to the pixel size of the imager. The image size is the size of the chip, and much larger than a typical microscope field. They have created a microscope that is as thick as a camera chip, which enables all sorts of miniaturized detection. The other intriguing new development was in building minature implantable components using 2 photon lithography. Two photon lithography is a mini-3D printing process in which a material sensitive to 365 nm, is illuminated in a microscope with 700 nm radiation. At the intense focus of the microscope, two photons combine to excite the resist and a small sphere is exposed. The sample or the spot is scanned in X&Y and the focus is moved in Z to create a 3D object. A group from Microresist showed that organo – silicon resists, with excellent environmental resistance could be 2 photon patterned. These materials were patterned into artificial cochlear bones that can be customized to an individuals ear. My take on all these developments is they show the power of “at scale” fabrication for both implantable, testing, and mimic parts. Really cool stuff! In my opinion this is the future of medicine!